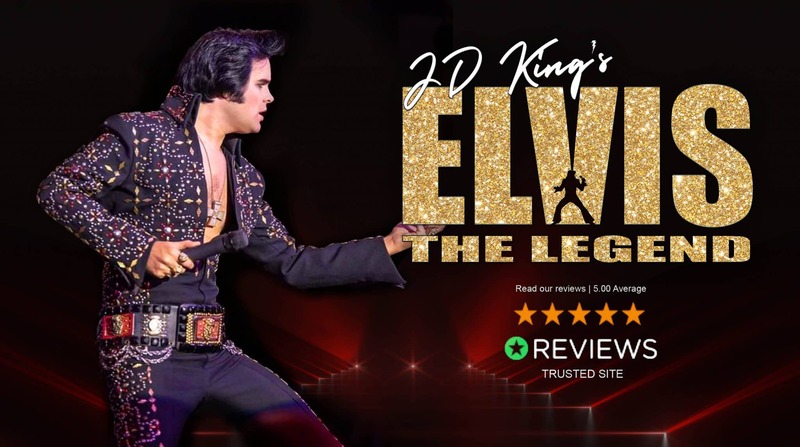 JD King (Jim Devereaux) is the world’s most exceptional Elvis tribute act – with more 5 star reviews from both professional publications and direct customers than all other Elvis impersonators – making him the best reviewed tribute artist working today. In 2017, he was the only performer in history to debut as headline act of the world’s largest tribute festival TribFest and due to popular demand be re-booked to headline again the very next year. 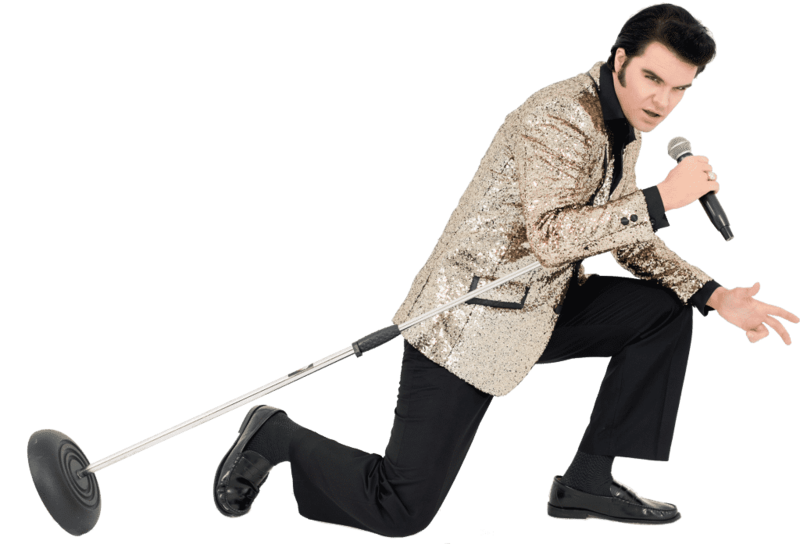 JD King’s ELVIS THE LEGEND is an exciting and theatrical revue show of Elvis’ most popular repertoire from across his 20+ year career and is touring the world over to 5 star reviews. 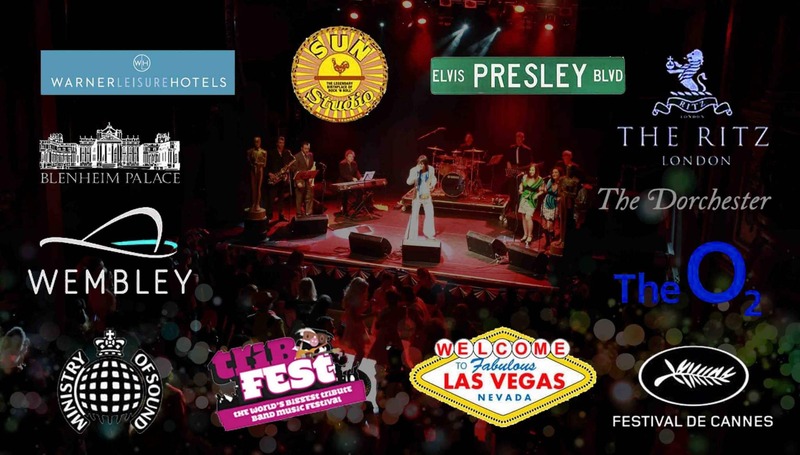 The show features his dynamic Elvis tribute band the Burning Love Band & Sweet Soul Singers. Throughout 2019 JD is touring theatres, concert arenas, race courses, open-air festivals and celebrity cruise experiences worldwide. He also has a residency at Warner Leisure Hotels in the UK. Buy tickets for his concerts or send a private event booking enquiry today. PROMO SONGS: Don’t Be Cruel, Love Me Tender, Hound Dog, Are You Lonesome Tonight, Such a Night, (You’re the) Devil In Disguise, A Little Less Conversation, Suspicious Minds, Always On My Mind, An American Trilogy, Hurt, Way Down. 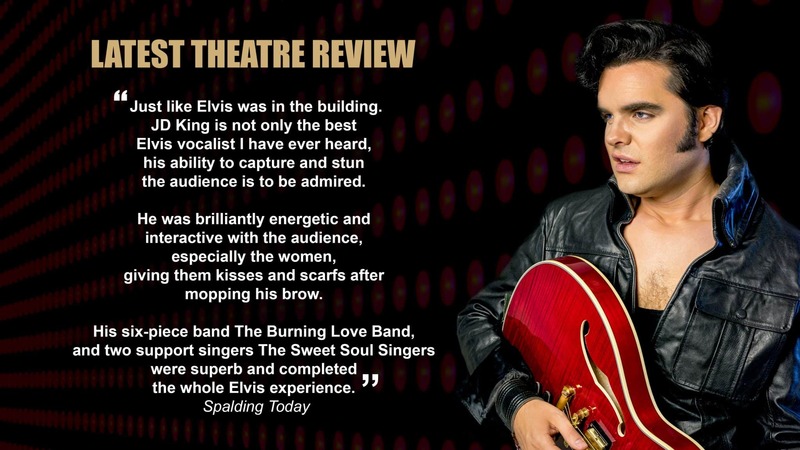 JD King has first-rate reviews from a wide variety of noteworthy and famous sources, as well as passionate testimonials from clients who are so happy with JD’s performances that they confidently claim JD King is the best Elvis impersonator in the world. In addition JD has a perfect 5 star review score from independent platform reviews.co.uk, surpassing other famous Elvis tribute artists. This site collates feedback direct from JD King’s customers, Reassuring you that when you book JD for your event you’re getting a first class and professional performance every time. JD was an absolute professional and great guy – probably the best Elvis tribute I’ve seen. Everyone thoroughly enjoyed themselves – he engaged with the and didn’t disappoint. We look forward to welcoming him back to Henley in the not too distant future. 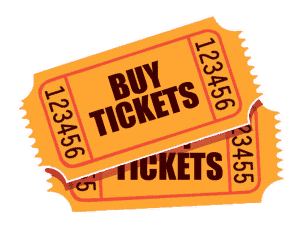 After performing at the Forum Theatre Northallerton on January 12th 2019, I am delighted that due to amazing audience reaction the show has been rebooked for December 15th 2019 and tickets are now on sale. Exceeded expectation. Wow! An absolute stormer. The audience absolutely loved Jim. He was flawless as Elvis and also very comical. A really enjoyable show. Please pass on with our HUGE thanks!! Due to the phenomenal audience reaction to this show in November 2018, we have already rebooked it for February 2020. We would like to thank JD King for his totally fantastic performance at our wedding 5 months ago. He brought everyone to the dance floor until the end of his set. It was so memorable and unique that our friends still talk about his show. My seven old daughter has now been converted to an Elvis fan after seeing him. We would see him every month if we could!! Thank you so much again. Always having been a big Elvis fan I vowed after his death that I would never go and see an Elvis impersonator because there can never be another Elvis. Wow am I pleased my friend persuaded me to go to see JD King! He is amazing. Every thing about him, his movement, his voice even that magic lip curl was absolutely fantastic. His stage outfits were unbelievable. Nothing but the best. J D becomes Elvis! It was just a magical performance. Thank you JD Elvis himself would have been proud with everything about your Elvis show. Many thanks. For more feedback please visit the reviews page. Elvis Presley Boulevard (Memphis, TN). Sun Studios (Memphis, TN). Las Vegas Boulevard (Las Vegas, NV). Film Festival (Cannes). Knebworth House (Hertfordshire). Blenheim Palace (Oxfordshire). Covent Garden (London). Edinburgh Fringe Festival (Edinburgh). Ministry of Sound (London). The O2 (London). Wembley Stadium (London). The Ritz (London). Royal Windsor Racecourse (UK). The Dorchester (London). KoKo Club (London). Selhurst Park Stadium (London). TribFest (Yorkshire). Devonshire Club (London). Texas. Ms Dynamite. Kim Wilde. Marty Wilde. Doctor & The Medics. Paul Zenon. Alastair Campbell. Arthur Brown. In addition, JD has worked with Elvis' guitarist John Wilkinson & Elvis' cousin Donna Presley-Early. JD has performed privately for many more celebrities both in the UK and US, but for security and privacy reasons their identities cannot be listed publicly. He has appeared as Elvis many times on UK television, prominently featured in programmes: The Voice, Put Your Money Where Your Mouth Is, South Today and the Daily Politics. JD also starred in an episode of Sky Living's primetime show Sing Date, singing Elvis songs throughout the episode. Jim has given numerous interviews on talk RADIO, Radio Reverb and JUICE FM and has been heard singing Elvis songs on Southern Counties Radio. He also has had featured interviews and articles about him published in the i Newspaper as well magazines Ideal Bride and Beauty & Ruin. Whether you're watching JD King's ELVIS THE LEGEND show or at a special appearance at a private event, JD presents a dynamic experience designed to meet the audiences requirements and expectations. He specialises in all the eras of Elvis, from the energetic birth of Rock 'n' roll in the 1950s to the glitzy ballads of Las Vegas in the 1970s, transporting you back to that time in a way few others can imitate. JD knows over 230 Elvis Presley songs, including all of his hits, and can prepare any other rare Elvis' number to suit the needs of a special event (upon request). Jim Devereaux is part of Equity, with public liability insurance (PLI) covering his performances up to £10 million. Also, all equipment used in JD King's shows is operated by professional technicians, is PAT tested and fully compliant with current regulations, providing technical assurances to prospective venues. For more content from his shows, you can connect with JD King on YouTube, Facebook, Instagram and Twitter. The answers to the most commonly asked questions can be found on our FAQ page - but if you have any other questions about the show, or you are interested in booking JD King for a private event, please visit the contact page.